There are many tales of "travellers from the stars" visiting primitive people -- ranging from the ancient astronauts of W. Raymond Drake and Erich von Däniken, to the twentieth century "Sirius Mystery " associated with the Dogon people of West Africa. Like UFO reports, these tales tend to suffer from the "Law of the Excluded Middle"... people assume they are either completely true (and hence evidence of extraterrestrial visitors), or they are completely false (nothing but a baseless legend -- the mainstream view). But there is another possibility. The tales may be true insofar as the mysterious visitors really existed, and really did claim to come from the stars... but false in that they were merely explorers from another earthly civilization, who for one reason or another found it expedient to pretend they came from another planet. This exact situation occurs in H. Rider Haggard's novel King Solomon's Mines (1885), which describes the discovery of a lost civilization in a then uncharted region of Africa. On first encountering the lost tribe, the hero Allan Quatermain is forced to think up an impressive-sounding alibi to prevent his team from being massacred on the spot. 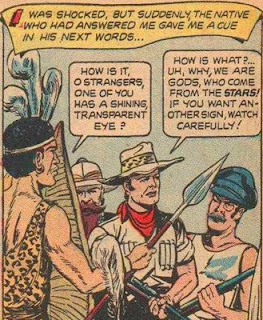 The illustration on the left comes from the children's adaptation in Classics Illustrated (issue 97 from July 1952, now in the public domain), but Quatermain's speech in the original novel is more specific: "Nay, ye shall know the truth. We come from another world, though we are men such as ye; we come... from the biggest star that shines at night." The fiction of "travellers from the stars" is maintained right through to the end of the novel, and one can imagine that after the explorers' departure the suitably awed natives would pass the legend on for generations to come. Indeed, with the reference to "the biggest star" they would have their very own Sirius mystery!